As this blog has extensively documented, Leytonstone’s Business Improvement District (BID) scheme, and more particularly the company that is supposed to run it, the E11 BID Co., have rarely been free from controversy. Now fresh revelations suggest that the worrying pattern continues. On paper, the way that the BID works is fairly straightforward. Each business rate payer in Leytonstone is billed annually for one per cent of their property’s rateable value; the money is collected by LBWF and then passed on to the E11 BID Co.; and the latter then uses it to make the area commercially more attractive, thus benefiting not just the traders but also the local community as a whole. Separately, LBWF also provides augmented services in the BID area, some paid for by the taxpayer, some purchased by the E11 BID Co..
Underpinning each off these transactions are a series of legal imperatives, some deriving from the BID legislation, some enshrined in specially constructed contracts and service level agreements. So much for the theory. What about the reality? In the past, various leaked reports have demonstrated that the E11 BID Co. has been poorly run, failed to pay its taxes, and accrued large debts. More recently, the impression is given that such failings are a thing of the past, and the company now operates on an even keel. But the most extraordinary revelation is the fact that there are now, not one, but two separate E11 BID companies existing in parallel. The original, E11 BID Co. Ltd. (no. 06291577), was incorporated on 25 June 2007; is a private limited company; gives its registered address as ‘Second Floor, Leytonstone Library, 6 Church Lane, London, E11 1 HG’; has two shareholders; and is a signatory of various legal agreements with LBWF regarding the BID levy etc.. The newcomer, E11 BID2 Ltd. (no. 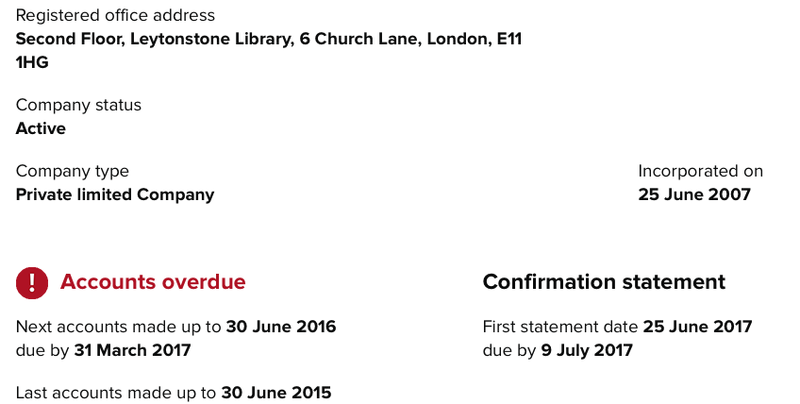 09664542), was incorporated in 30 June 2015; is a private company limited by guarantee without share capital; also gives its registered address as ‘Second Floor, Leytonstone Library, 6 Church Lane, London, E11 1 HG’; and has many of the same directors as the E11 BID Co..
‘A new BID company…was set up following recommendations from an independent audit that advised re-registering E11BID company as a company limited by guarantee. On 1 April 2016, E11 BID 2 company started trading and all assets and liabilities were transferred from E11 BID company to E11 BID 2 company. E11 BID company has ceased to operate’. However, as is often the case with LBWF attempts at clarification, this only begs further questions. Most obviously, LBWF’s description of the timeline involved is inconsistent with other significant evidence. LBWF suggests that it only started dealing with E11 BID2 Ltd. when the latter allegedly began trading on 1 April 2016. However, the truth is that it sent out levy bills, explicitly marked E11 BID2, as early as 28 April 2015 – that is, two months before the new company was even incorporated! All told, it is a bit of a mess, which over the coming months will inevitably require further scrutiny. LBWF’s relationship with the local business sector: new revelations about the E11 BID Co.
Cllr. Johar Khan and the E11 BID Co.